Deceased badgers, benches in memoriam & horses in pyjamas #narrowboat #England – The Diesel-Electric Elephant Company. I met an Australian chap the other day, he was in England for three months and intending to walk along the canals. He’ll get on better now that I’ve explained how much easier it is to walk along the towpath instead. I walk along the towpath quite a lot. It’s not that I want to show off or anything, but someone has to keep these old skills alive, and it’s really not difficult. Let’s face it, in the rich panoply of life-skills, those required for walking are really quite pedestrian. To begin with I make sure that my feet are downmost in the gravity-well and my head as far in the opposite direction as it will go, then I put one size 11 boot roughly in front of the other and engage “stagger mode”. Lots of people are amazed to see the “the walking” being done in real life, having only ever seen it in museums before, and very, very few are aware that the technique may be used successfully over distances longer than from sofa to refrigerator, or from front door of house to car. I met a woman out walking. She was emptying her dog. The dog was a labrador, and everyone knows that emptying a labrador dog is almost as involved and long a process as is filling it. She was a miserable dump-truck of a woman (and I refer to her character, not her physicality). The dog obviously already knew this, because it was ignoring her every shrill squeak of command. I made the mistake of doffing my cap, saying hello and remarking on the propensity of labrador dawgs for selective deafness. When out a-walking I obviously neither look like a boater nor give off boatish vibes. Note to self – buy some gold braid and a reefer jacket. I let her ramble on and get today’s venomous diatribe out of her system, while dawg got yesterday’s six hearty square meals out of its system, all over the towpath. Once she’d run out of anti-boater bile, turning quite puce in the process, I smiled again, doffed my cap again, and remarked that I considered the matter to be inconsequential in juxtaposition to dog owners letting their dogs squat and squit all over the public pathway without the slightest intention of cleaning up. She wasn’t impressed. I am not expecting a Christmas card. Her dog, however*, gave me a “high-five”, a conspiratorial wink and one of his business cards. While we’re on the subject of the distasteful, I was also “treated” to the sight of a deceased badger floating down the canal (actually, it was floating up the canal, but you can’t expect wildlife to understand such nuances and, anyway, “up the canal” sounds wrong, somehow). I have doctored the photograph to include a few star-sparkles, not out of any sense of disrespect, quite the opposite. A chap can’t just go posting photographs of dead badgers about without some sort of attempt to alleviate the gloom. Badger resting after doing the post-mortem backstroke. RIP, little buddy. Poor old brock looked as though he’d been in the drink for a day or three, albeit with no obvious signs of injury (other than perhaps “death by dying”), and his belly was a tad distended and looking fit to burst. I didn’t linger. I have no intention of spending two hours a week for the next sixty years on a psychiatrist’s couch working through the mental scars left by being involved with an exploding badger. RIP, little buddy. The mood of my perambulation lightened itself a little, just some eight and three-quarter miles farther on. I saw horses, shamelessly still in their pyjamas and obviously holding no intention whatsoever of getting properly dressed for the day. What might be finer – excluding North Carolina – than a day lounging about in a field of grass with comic books, some sweeties and no school? 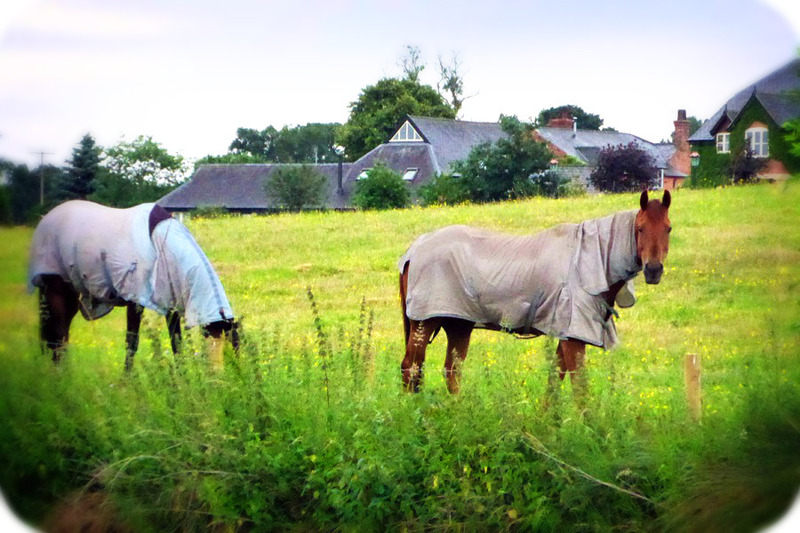 Latchkey horses. Some of the signposted walks and human “rights of way” in Cheshire are a little less than overly-frequented. In fact, some of them are damned nigh impossible without native porters and a machete. Oh, this being the “Essex of the North” and all that the gates are posh and solidly crafted, it’s just that some of the paths themselves are enthusiastically foliaged shall we say. It took all of my intelligence and skill to climb over this. I felt the need to yell out ‘Is that you, Livingstone?’ on one or two of the bridges. Damn it, Livingstone, send up flares or something – unless they’re white polyester, in which case don’t send them up (I haven’t got the heels with me). Boat-hating Labrador-emptiers and exploding badgers aside, there are manifold laughs and giggles to found alongside England’s canals. Chief among these are the benches dotted around for the weary soul to rest a buttock or two upon. These benches are never where anyone walking the canals might need them, but always situated where those carrying the bench and setting it in concrete or whatever thought was “quite far enough from the van, thank you, Cyril”. The giggles come from the little dedication plaques that adorn most of them… When you think about it, a bench “in memoriam” is an odd thing, given that everyone is going to approach it in reverse, coat-tails raised and tired buttocks quivering, rather like a lavatory, and quite the opposite of genuflecting. The best though by far of these was the bench that detailed the deceased’s name and etceteras and then proclaimed ‘Here is where he would want to be’. Not in either of the binary religious options, Heaven or Hell, not still alive and in a pub somewhere wrapped around sixteen pints of Bishop’s Todger, not even at home with loved ones, but there, under my flabby pasty-whites while I removed stones from my shoes. This takes service to one’s fellow man a step beyond, I think. If anyone is in any doubt as to where I might “want to be” when I’m dead then please take note that the address is Young again & the spitting image of Mr Brad Pitt, Still Knowing What I Know Now, The National Lottery Collections Office and signing for the cheque for the first ever single-ticket five-hundred million pounds win. If that’s not possible then I suppose that you might leave my coffin at the canalside with a little plaque inviting people to sit on it for a while until they feel like walking on. Enough already with the diatribes and the hair-trigger gas-filled wildlife and the thoughts of (other folks’) mortality, this was actually a very pleasant walk in the rain and I enjoyed it immensely. Perhaps I was just giving out excess vibes of a negative nature without intending to? The final two giggles of my walk related more to the land of the living. Ever wonder why so many people dismiss solar panels and just cannot be convinced that they work? This is why. The “experts” convince them that the panels must be tilted to gain the maximum benefit from the sun – and then, having been fitted once at some random tilt, no-one ever adjusts them ever again. Here we see panels not just tilted away from the sun but tilted to face tall trees! No ruddy wonder that the ergs aren’t flowing into the electrickery buckets. To indulge, and to wit – not to mention to quote that well-known Greek cad and author of the Iliad and the Odyssey, Homer – D’oh! The next giggle took me right back into the colourful world of England’s canals, far away from ergs. I have happiness running down both legs. What exactly was it that he was leaking and so wanted to avoid getting onto the deck of the boat? Whether boating or walking, you can’t really beat the wildlife on England’s canals although, should you absolutely have to, I recommend short, sharp belts with a big stick. Lacking in peculiar sights and giggles it is not. Yes indeed, I could sit and watch people walking the tow path in the rain and wonder why dog walking makes people so grumpy. If you have a dog, I say, expect to have to walk it and ablutionate its behind! Coming from a great lineage of ‘sitters’ I do think more could be done to strategically place seats where they would be most beneficial. In Scotland of course, where memorials of all kinds are placed in abundance, and memorial Cairns in particular are scattered about the hills, these are not meant of course for sitting on, and wouldn’t be a comfortable recline. I understand that each of the savage clan members going into one battle or another, placed a stone on such a site as they advanced, taking their stone back if left alive after. This I am informed is why Scotland is littered with so many incomplete piles of stones. Dear old Scotland. I hear that the wild haggis have returned to much of the land, roaming free, honking out their mating calls. My family used a similar system to the stone system that you describe whenever we went into battle, except that we used Cairn Terriers. I have often thought of towing a small bench along behind myself while walking. Nothing too ostentatious, just something in oak with velvet cushions and perhaps a small ornamental fountain.